Finnkino is developing the Finnish cinema scene by opening the most modern cinema in Finland in the Itis Helsinki shopping center. Finnkino Itis will open by the end of 2018. The new theatre will include nine cinema halls, one of which will be the first IMAX® theatre in Finland. “The long-awaited Finnkino Itis theatre is now under construction. We look forward to the moment when we can show our guests the first movie in Finland's first and only IMAX theatre in Finnkino Itis", says Veronica Lindholm, CEO of Finnkino. According to Lindholm, Itäkeskus in Helsinki is a strategic location for the new top theatre. “East Helsinki and its surrounding areas have lacked a full-scale movie theatre and we are now filling the gap. Thanks to good connections to Itäkeskus, we believe that movie goers from nearby areas as well as from elsewhere in Finland will come to Finnkino Itis. We are confident that Finland’s first IMAX theatre will attract plenty of guests”, Lindholm says. Construction plans for the thousand seat Finnkino Itis and Finland's first IMAX theatre started a year ago. Currently, the theatre is a big hole in the ground and it will begin to take shape during next year. “IMAX provides guests with the world’s most immersive cinema experience, allowing them to enjoy the biggest blockbusters like never before. IMAX’s cutting-edge projection system, which delivers crystal-clear images, coupled with IMAX's customized theater geometry and powerful digital audio create a unique environment that will make audiences feel as if they are in the movie”, explains Dolci. 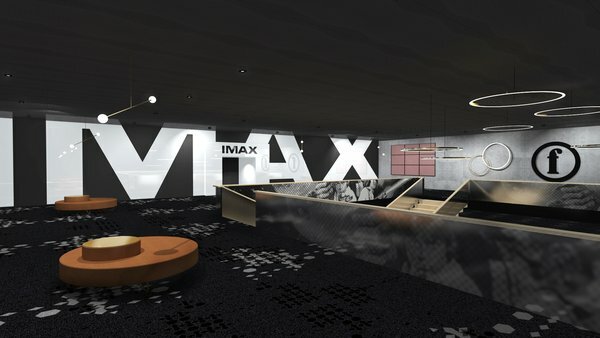 According to current plans Finnkino Itis will feature an approximately 315 m2 large screen as well as IMAX®'s own 12.0 channel Immersive Sound Audio System. Currently, there are only two other IMAX cinemas in the Nordic countries in addition to the one built by Itis. Belinde Bakker, Commercial and Operations Director of Itis, considers the new cinema a great first step in re-positioning the shopping mall. “Consumers expect shopping centers to offer more than just shopping and we are delighted to meet these needs by introducing Finland’s first IMAX theatre in cooperation with Finnkino, the leading cinema chain in Finland”, states Bakker. To complement the state-of-the art cinema, a brand new, high-quality restaurant area will open right next to it. The renewal of Itis' F&B offer will also include a complete refurbishment of the existing food court opposite to Finnkino. Additionally, services for families are improved, and planning is ongoing regarding a leisure zone. “Our goal is to make Itis the number one shopping and entertainment destination for families in Helsinki. With the best cinema in Finland, we will hit the ground running”, explains Bakker. Take a look at how the new IMAX and the ultramodern Finnkino Itis movie theatre will look! The AR (augmented reality) presentation can be found at www.finnkino.fi/itis.